I badly need a book light. Because the best time to read without other stuff to think about is when you're in the bed waiting for the sleep to arrive. It's the only time when you're not worried about checking the mail every five minutes or looking what others are tweeting about. The only time you have when the book is the world for you. But then there's the problem of light. When you're at the bed it's dark. No luxury of a bedlight which you can turn off just on the moment sleep engulfs you. We people are boarders. No one to turn our lights off when we fall into sleep. So the only option seems to be a booklight. 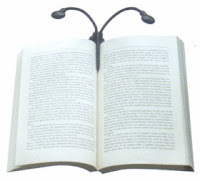 I browsed sites about booklights for several days, but still haven't made up the mind to buy any particular one. Firstly, there was the problem of no credit card, but that problem will soon be solved with a Sampath web card. Then the price. A fairly good one will cost at least $15 which of course is too much for a chap like me. And the other problem is charging it. Seems most of the lights available on ebay are battery powered, AAA ones in that case. Their prices ain't sweet either. Of course, a recharger has to be bought, but still have to pay some handsome money for that, too. The best option would be to look for a light coming with a power pack, as the laptops do. Not quite sure of the availability anyway. If anyone of you readers have experience in using one, please be kind to share the story. 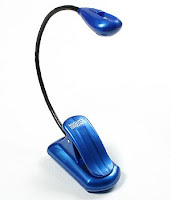 There are small USB desk lights in pettah and I have seen them at Unity Plaza also. They can be a good substitute for book lights.